Six months after announcing its new South Carolina manufacturing plant, Samsung said that it is on track to produce 1 million washing machines in 2018 and create over 1,000 jobs by 2020. NEWBERRY, S.C.–Samsung Electronics America, Inc. has announced the start of commercial production at its first U.S. based home appliance manufacturing facility in Newberry County, South Carolina. Only six months after taking possession of the plant, Samsung employees have begun manufacturing ship-ready washing machines, producing the products' washer cabinets, inner tubs, and bases from blank steel, the company reported. 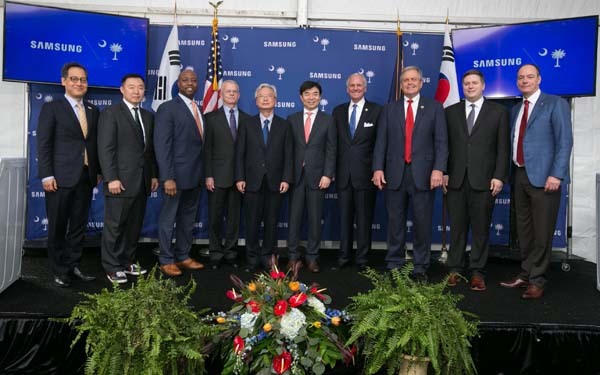 Hyun Suk Kim, president and head of CE (Consumer Electronics) Division of Samsung Electronics, visited the Newberry plant to celebrate the official launch of production, along with the CEO of Samsung Electronics North America, Tim Baxter, South Carolina Governor Henry McMaster, U.S. Senator Tim Scott (S.C.), and U.S. Representative Ralph Norman (SC-05). Samsung (www.samsung.com/us) has already hired over 540 employees to staff the facility, 90 percent of whom are locally-based in Newberry County and surrounding communities. By 2020, the $380 million plant will have created nearly 1,000 local jobs, according to the company. Samsung has hosted or participated in seven job fairs and built an entire curriculum for workforce training since its announcement in June 2017. In December, Samsung announced a new research and development partnership with the state of South Carolina, Clemson University, and the University of South Carolina to create the Palmetto Consortium for Home Appliance Innovation [PCHAI]. This robust R&D program is intended to catalyze innovation, foster public/private collaboration, and nurture the next generation of advanced manufacturing professionals in South Carolina. "As we begin commercial production of washing machines here today, our vision extends beyond manufacturing alone," said Tim Baxter, president and CEO of Samsung Electronics North America. "Our ambition is for South Carolina to become Samsung's U.S. hub for every stage in the home appliance lifecycle-from concept and R&D to manufacturing, quality assurance, distribution, and customer care." In addition to its facility in Newberry County, Samsung operates a customer call center in Greenville, South Carolina, that supports 800 full-time and contracted jobs. The company's recent investments in the U.S. are reported to total more than $10 billion. Its acquisition of Connecticut-based Harman International for $8 billion represents Samsung's largest acquisition to date and positions the company to be a leader in the connected car market. The company has also committed $1.2 billion to U.S.-based Internet of Things R&D and investments over the next four years, and $1 billion to expanding the Samsung Austin Semiconductor facility. The Austin, Texas facility was established in 1996 and is reported to be one of the largest foreign direct investments in the U.S. and the largest ever in Texas.